RPM: Smilin’ Jack likes his Bear … rrrrrrare! The ol’ clock on the wall says it’s time again for our dear ol’ friend and Lee County radio legend Smilin’ Jack Smollon. This week’s installment of Rah-rahs Per Minute, our series focusing on the vinyl (and other-formatted) sounds of Auburn Spirit too long relegated to the rotting Shasta box bulk-bins of our thrift stores and garage sales, is another one of … oh … 100 or so numbers salvaged from the Dumpster behind the old WJHO offices (now WANI) in Opelika. It’s a special week of course and Smilin’ (and fightin’) Jack won’t let you down. Let’s just say the man was prolific when it came to the Iron Bowl. Of course, we’re saving some of his doo-wah ditty-ditties for next year (and the year after). So stick around and we’ll make it worth your while. Eventually. It’s a short one. Short and sweet. But just you wait ’til the end. Wait for it. The rafters shake from that “WAAAAAAAAAR EAGLE!” Gives me chills. Beat Alabama on December 3! Beat Alabama take the SEC! Hail hail the gang’s all here for the Alabama Maaaaa-sssssa-creeee! Auburn Tigers best in the land/Give them Tigers a great big haaaaaaand. … need more pep? 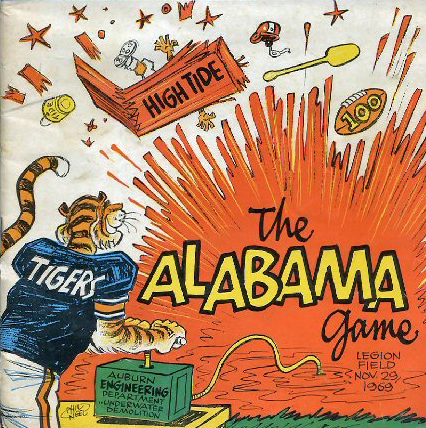 Don’t forget the 1956 Beat Bama pep-rally. You can download the audio. It will blow your mind. I’m thankful for The War Eagle Reader, the treasure trove of Smilin’ Jack and whoever threw them in the dumpster unleashing them forever.